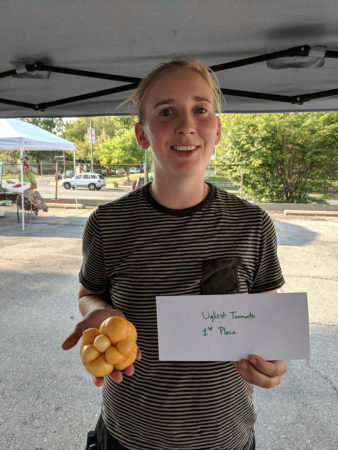 The Northeast Farmer’s Market, located at 3001 Independence Ave, held its 3rd Annual Tomato Contest on Thursday, August 2. Vendors at the farmers market entered their tomatoes into three different categories; Ugliest Tomato, Prettiest Tomato, and Largest Tomato. Visitors to the market voted on their favorites in each category. The winners received cash prizes, donated by the Independence Avenue CID and Northeast Kansas City Chamber of Commerce. Jenna, of Northeast Farmer’s Market, grew the ugliest tomato, although she personally believes that it is the prettiest. 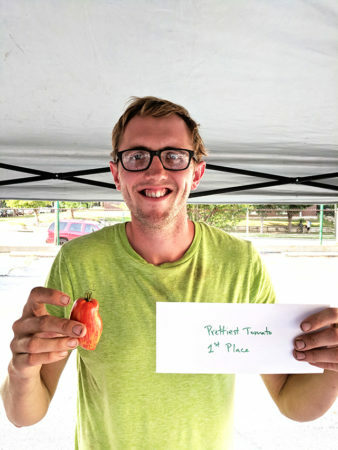 Trent, from the Bread and Roses farm, officially grew the Prettiest Tomato, which almost looked more like a pepper than a tomato. 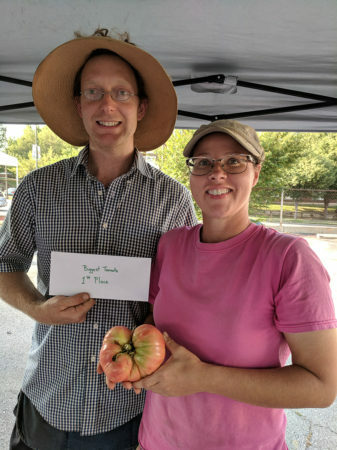 Jeff and Jessica from Pink Pony Farms grew the Largest Tomato, which weighed 1lb 6.oz. Slice that up and put it on a burger!